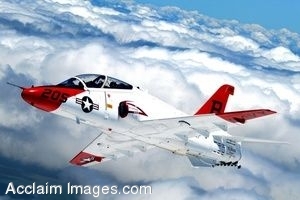 Description: A T-45A Goshawk executes a turning rejoin during a recent formation flight over South Texas. The T-45 is a twin-seat, single-engine jet trainer and is the only aircraft in the Navy's inventory used specifically for training pilots to land aboard aircraft carriers. U.S. Navy photo by Lt. j.g. John A. Ivancic. Clip art photograph by Department of Defense Public Domain.